You don't have to be in Austin long before you realize that people here pride themselves on being different. "Keep Austin Weird" is a slogan plastered everywhere. To me, the city is more "original" than weird -- packed with independent stores & restaurants and bearing an attitude of insouciance & the off-beat. It is an altogether engaging place to be. A question though: is it the Austin attitude or the Whole Foods attitude that produced these parking jobs? All within a twelve-car corner of the lot. 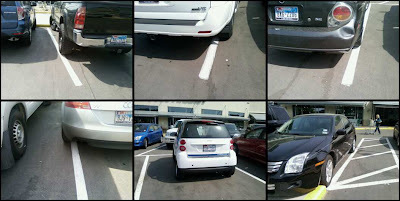 Even the Smart Car failed Driver's Ed. I like Austin and the "hill" country. I think its pretty. People are interesting there.